As we approach the 2014 midterm elections in the United States — the unofficial start of Barack Obama’s lame duck presidency — it is worth considering how the once giddy European love affair with Obama will come to a close. It might not be in an acrimonious George W. Bush–style divorce, but it is likely to end in disappointment and regret. Europe had great expectations when Obama became president. A few were met, but most were not. Recall that Europe broadly opposed the U.S. occupations of Afghanistan and Iraq, found Guantánamo to be a legal black hole and has become increasingly weary of continued U.S. support for Israel. At the very least, there was the hope of a move away from the insular machismo of the Bush years toward a more receptive, less hawkish global agenda. Europeans were clamoring for Obama to get up in front of them. In fact, they were clamoring for him before Bush left the stage. When Bush came to power in 2001, he inherited Bill Clinton’s European goodwill: 83 percent of British, 62 percent of French, 78 percent of German and 50 percent of Spanish citizens had a favorable opinion of the U.S. By the end of Bush’s presidency, the poll numbers had tumbled to abysmal levels. The most damning public opinion figures to come out of Europe were in relation to Bush’s global statesmanship, and the numbers were truly epic. In 2008, for example, only 14 percent of German and 13 percent of French respondents felt confident that Bush would “do the right thing in world affairs.” When asked the same question in 2009 about Obama, the numbers were astoundingly high: 93 percent and 91 percent, respectively. In his July 2008 speech in front of Berlin’s Brandenburg Gates and tens of thousands of adoring fans, Obama made a promise to Germany, Europe and the world. Should he be elected, there would be an era of “allies who will listen to each other, who will learn from each other, who will, above all, trust each other.” The Europeans bought it. He was a new American leader, a young, charismatic African-American who would reconnect the U.S. with the world, while healing racial divisions at home. An important byproduct of Obama’s win was that Europeans began to ask when Europe would elect its first minority leader. The U.S. had, at least in this respect, become a role model. Bad romance – Where did it all go wrong? Ironically, the first cracks in the Europe-Obama romance came from the ultimate symbol of that adoration: awarding the 2009 Nobel Peace Prize to a U.S. president who had been in office a mere nine months and done little to promote peace anywhere yet. As much as Europe loved Obama, the Nobel had the dual effect of reminding Europeans of the continued U.S. occupations of Iraq and Afghanistan, of the continued existence of the Guantánamo Bay prison and of just how little Obama had done to deserve the award. The journalist Peter Beaumont wrote that “the prize appears to have been awarded to Barack Obama for what he is not. For not being George Bush” and that the award would prove to be an “albatross around his neck.” In fact, Obama and his staff appeared to feel the same way. As Obama approaches retirement in 2017, Europe will likely look back at his old promises and ask wistfully, What happened? As the first Obama term came to a close, Europe watched from the sidelines as Iraq and Afghanistan descended into bloody chaos and drones killed innocent men, women and children in Yemen and Pakistan. And Guantánamo didn’t just disappear. Nothing symbolized the tortuous excesses of the Bush years more than the extrajudicial prison on Cuba, where the denial of habeas corpus was deemed unconstitutional by the U.S. Supreme Court. Despite anti-Guantánamo proclamations during his candidacy, Obama’s commitment to the closure of prison became a distant memory. The division between Bush and Obama foreign policy became, at least to European eyes, increasingly blurred. In a March 2014 speech in Brussels, Obama even went so far as to say that, with Iraq, the U.S. had “sought to work within the international system,” and that, “we did not grab its resources for our own gain” but had “left Iraq to its people in a fully sovereign Iraqi state that can make decisions about its own future.” The revisionist, retroactive logic would have made Donald Rumsfeld proud. Obama’s second term has done little to bolster trans-Atlantic support. The revelations from National Security Agency whistleblower Edward Snowden regarding U.S. surveillance in Europe and the imprisonment of Chelsea Manning all suggested the rapid evolution of a security-state America that Europeans traditionally associated with Republican administrations. By the time the Israelis began their 2014 assault on Gaza — with massive loss of civilian life, including hundreds of children — most Europeans had lost hope that Obama would help, a feeling confirmed by the fact that the U.S. was restocking Israeli munitions while calling for peace. As the midterm elections draw near, the events of Ferguson, Missouri, have reminded Europe that economic disparity, militarization, a culture of police violence and racism still permeate the United States. Obama’s work on U.S. health care was an important bright spot, but Ferguson illustrated how systemic problems in the U.S. require more radical solutions than Obama was willing (or able) to tackle. Although his approval ratings in Europe are still positive (and nowhere near Bush-level), the zeal for Obama has diminished. The Pew Global Attitudes Research Project noted that the “Obama bounce” is now “a thing of the past,” and numbers show that European views of the U.S. have continued to decline since 2009. In the case of Britain and Germany, the percentage of respondents who held a favorable view of the U.S. in 2013 was 25 points lower than in 2000, when Bill Clinton was about to leave office, and in Poland and the Czech Republic the numbers were 20 points lower. In France and Italy, favorable opinions of the U.S. in 2013 fell back roughly to the levels of 1999 and 2000, despite spikes after the Obama victory in 2008. These numbers indicate a status quo Obama presidency. But that is not what Europe expected and not, for that matter, what Obama promised. As he approaches his enforced retirement in 2017, Europe will likely look back at those clips from that incredible evening in November 2008 and ask wistfully, What happened? And I suspect that many Americans know the answer. What happened, they will say, is the reality of U.S. politics. President Obama may have smoothed its tone and rhetoric, but, in the end, he played the same game. 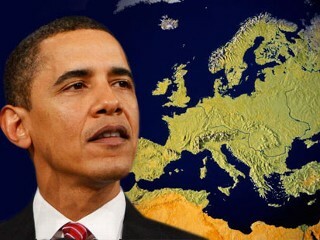 The Europeans are disappointed with Obama for the same reasons many Americans are.